Request an Exam Copy (Teachers/Professors Only) of this title. Heralded since its first publication in 1964, Clyde Pharr's Vergil's Aeneid, Books I-VI has shepherded countless high school and college students through the intricacies of this masterpiece of poetry. This text continues to serve courses studying the full text of the first six books of the Aeneid. This is the book that revolutionized Latin textbooks, with its student-friendly format of vocabulary and notes on the same page as the Latin text, and unique pull-out vocabulary of most-often repeated words. Together, these allow for faster reading, unimpeded by the page-turning required to look up vocabulary or consult notes. 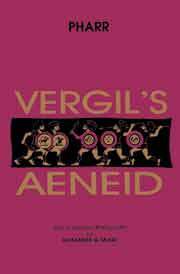 Pharr's Aeneid is the all-time most popular textbook of Vergil's Aeneid. Grammatical notes are supported by a full grammatical appendix; vocabulary memorization is aided by vocabulary lists, arranged by frequency of occurrence, for drilling. The perfect edition for both classroom and home study.